Well, actually, if you do it right, that is really all the time you need for the type of practice I have in mind. And when you do it right, you will make more progress in those three minutes than from hours of mindless playing. I know that is hard to believe, but I have seen it work time and time again. The reason that the above seems so hard to believe is that it shatters this idea that practicing has to be a long, drawn-out process to “count”. Get me right, long practice sessions can be wonderful. It is not so wonderful if you are just mindlessly moving your fingers, however. I want to make the point here that a specific kind of three-minute super focused practice (I call it PORA) is extremely powerful when done right! In our online course, I often talk about doing an exercise (usually a technique-based one) in an ultra-focused manner. I guide you to focus your attention on various, very specific aspects of your playing. But you can also apply the same concept on your own. Identify four items in your playing that you need to work on. Next, pick a very short piece of music (such as a couple of bars of a song, half a permutation sequence, a two-octave arpeggio…). Then, you play the piece four times in a row focusing your attention intently on only one item from your list at a time. So in round 1 in our example, all you care about is that you are keeping the fretting fingers close to the strings! Right now, it does not matter what your plucking hand is doing or if the metronome is switched off or if you sound choppy. But your fingers are feeling the strings. You can sense the muscles relax that would usually jerk them away from the fretboard. All that matters is that you keep fingers close to the strings and the more senses observe and confirm this, the better: See and feel the fingers touch the strings! Feel each individual finger; get as detailed as possible. The second time you play it, you forget about all that and zoom in on that click. Can you make it one sound, so that you are so on top of it that it melds with your bass notes? Fingers flying? Let them! You get the idea. What exactly did I hear? This is part of my PORA method, a very simple (but not so easy!) step-by-step learning process. Find out more about PORA here. Download the guide and put it up in your practicing room! So, yes, three minutes only! The main point of this post is that if you do it right, it really only does take about three minutes. That is about as long as you will be able to keep your attention focused in the beginning if you are serious about it. When you start out with the method you may just be with it for a few seconds before your mind begins to wander (which is entirely normal, just return back to the object of your focus as soon as you notice it). This method is the single most powerful way I know to change a habit. Unconscious habits abound in our playing – from pulling up a shoulder, to “flying fingers” as Scott Devine aptly calls them, to details you hear (especially when listening to your own recordings), such as uneven tone between the fingers or choppy phrasing. How about details of timing and the right notes? Imagine trying to change all of this at once. It is impossible! What the PORA method does in these precious three minutes is to help you focus in on a single distinct item. I recommend keeping your list to no more than four items. It is super important that you don’t just move your fingers, but that you are focused in on your topic like a laser beam. That’s why I have you write them down, one by one, so you know exactly what you are doing when! What PORA also does – and this is huge! – is to help you listen to yourself. It is too easy (and human nature) to get wrapped up in listening only for the right notes and having our minds go in a million directions as we do this (from big stage dreaming, to the girl in the front row, it’s all good, just not during PORA!). PORA is like meditating on the bass, simple as that. If you have ever done any kind of sitting meditation (I use Headspace, a great app! ), you know that the first order of business is to calm the mind and focus on the breath. Here the breath is our fingers or the sound of the click. This trains the mind to approach playing in a completely different way, with focus and intent! Doing three to five minutes of PORA once (or, better yet, twice or thrice) at random times during the day will jumpstart your mind (and fingers) in completely new ways. By allowing your focus to be on one specific item only, you also train yourself to recognize when your playing just feels “right”. Remember how this feels and this will become and important guiding tool for your development. One day at your jam session with your buddies you will look down at your fingers and see that they are flying. Congratulations, that will be a pivotal moment! Instead of saying “drat, I am doing it again, this ain’t working!”, give yourself a pat on the back because what is happening is that the unconscious is now becoming conscious. You are beginning to notice it in your daily playing situations. What to do? Fix it by applying what you worked on in your PORA practice session and move on with your song. Ten minutes later, fingers flying again? Ah, smile knowingly, fix it and carry on. And before you know it, that new feeling will become ingrained in your hand and will be second nature. unconscious competence (you’re doing it correctly; you don’t even have to think about it anymore). Yes! Try it. The trick is to stick with the details. Below is the guide. Download it, put it up in your practice room and give it your best shot. Follow the steps precisely. This IS a shortcut, but only if you don’t cut yourself short with the details. Enjoy! Once you get the hang of it, it can get really addictive! 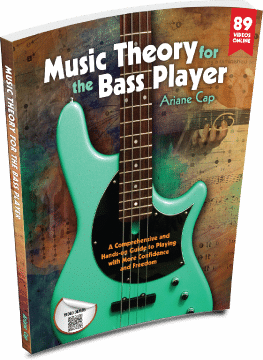 More about this in and my book, Music Theory for the Bass Player. And you will find plenty of materials to practice with this method in our 20 unit online course accompanying the book.